Our rose design mirror compacts are a useful and beautifully styled favor! Give your guests something they can use time and again and you can be sure each time they do use them, they'll recall your special event making them a perfect memento. Each silver finish hard-molded plastic compact measures 2.5" round. They are each packaged in a ready to give clear box with a metallic silver rope tie and a blow with an attached purse design "For You" tag. Our customers describe this as perfect for a "bridal shower" or "girls get-together". It's been given as a gift for women-only meetings and "quincineras" alike. Authentic and loved. An affordable way to give a thoughtful momento. I've unboxed the Rose Compact Mirror by Fashioncraft. It is a lovely wedding favor. Lovely textured rose on the front. And you open it up and you can see the two mirrors with intricate designs on the circular portion of one mirror. Durable plastic, lovely silver color, and a perfect memento or keepsake for that bachelorette party or your lovely guests at a wedding. Do these rose mirror come in individual bags? The Realistic Rose Design Mirror Compacts are individually packaged in a clear box with a metallic silver rope tie and a blow with an attached purse design "For You" tag. Do you have this ítem in gold? 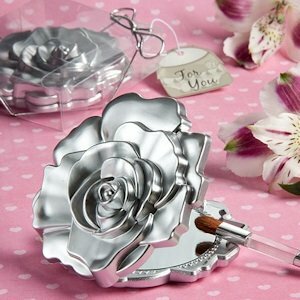 The Realistic Rose Design Mirror Compacts are only available in silver finish. Sure, just enter 1 in the quantity and your zip code to add a sample to your cart. We discounted both the sample (1 favor) cost and shipping as a courtesy to our customers who wish to see 1 before placing a larger order.